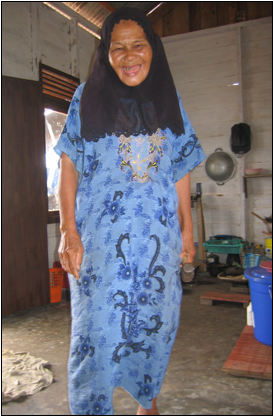 Aceh, Indonesia, September 30, 2005—When the Tsunami struck last December, Ibu Aja Cut of Teunom Village in the Aceh Jaya District on Aceh’s West Coast lost all her family members, save two grandchildren. Her house vanished off the face of the earth. The 70-year-old spent the next nine months in a six square meter emergency tent with her two surviving grandchildren. Two weeks ago, they moved into a newly erected temporary shelter. In the 36 square meter room with wooden walls, a metal roof, an open kitchen and two makeshift beds, Ibu Aja Cut, for the first time since the disaster, sees ray of hope. Before moving into the barrack, Ibu Aja Cut used to be one of the estimated 75,000 Tsunami IDPs living in tents without knowing when they would be able to move into permanent houses. “I have a roof, I have walls, I have a floor,” she said, pointing them out one by one. She held up her hands and produced a nail and hammer. She was putting up posters to make the temporary shelter her home for now. “I have a bed. I have something to eat. I even have dried fish!” she exclaimed. “But I don’t have a cupboard yet,” she laughed revealing a few remaining teeth. Before moving into the temporary shelter, Ibu Aja Cut used to be one of the estimated 75,000 Tsunami IDPs living in tents for months and months without knowing when they would be able to move into permanent houses. As the tents distributed during the emergency phase withered, so did the hope that they could move from tents to permanent houses before long. The living conditions in IDP camps, including water and sanitation, have progressively deteriorated over the past nine months. “We are tired of waiting,” said Mohamad Hatta, 30, the head of Pasi Village in Aceh Besar District, 47 kilometers south of Banda Aceh on the West Coast. He is the only surviving member of his family. He explained that villagers could not go back to where they used to live, as the land is no longer suitable for habitation. And while Hatta said it would be nice to sleep on the floor, not on the ground, he is not sure how he will keep up his hope, after many months of waiting. 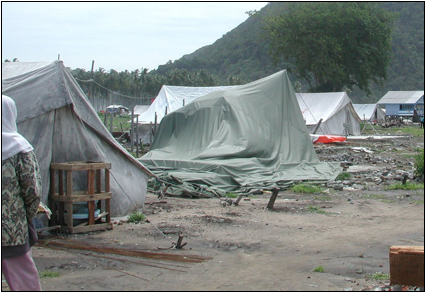 In order to assist IDPs living in intolerable conditions, the newly established Office of the UN Recovery Coordinator for Aceh and Nias (UNORC) has developed a plan of action to get the IDPs out of tents as quickly as possible. The Temporary Shelter Initiative, a joint endeavor by UNORC and the International Federation of Red Cross, comprises a three-fold plan to alleviate the suffering of the IDPs throughout the Tsunami affected regions. The initiative will provide up to 20,000 temporary shelter units for those living in tents. Under the initiative, the existing temporary living centers will also be upgraded for the estimated 90,000 IDPs whose standards of living have become unacceptable. The 250,000 or so IDPs who live with host families and who are desperate, as resources are stretched thin, will also receive assistance. The initiative will ensure that water and sanitation and primary health conditions are improved. The Temporary Shelter Initiative is a joint endeavor by UNORC and the IFRC to alleviate the suffering of the IDPs throughout the Tsunami affected regions. To support the initiative fully, BRR and the Government of Nanggroe Aceh Darussalam developed plans to make available public land for new settlements. BRR and the Governor also produced a joint statement to implement the plan. The initiative, moreover, is also endorsed by the UN Secretary General Kofi Annan and the Special Envoy for the Tsunami Recovery, U.S. President Bill Clinton.